Saturday 26th January was Australia day. 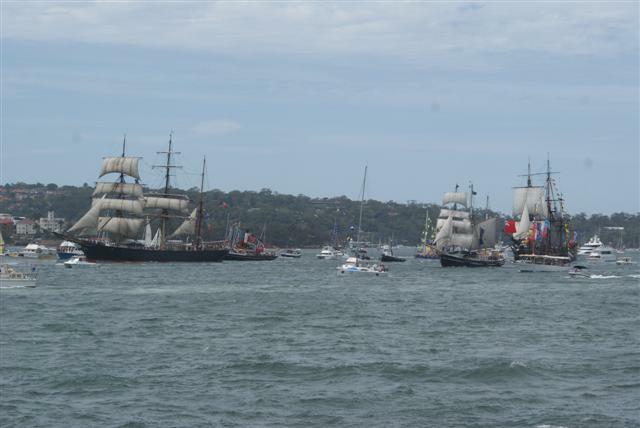 It was created to celebrate the arrival of the ‘first fleet’ arriving in Botany bay in 1788. 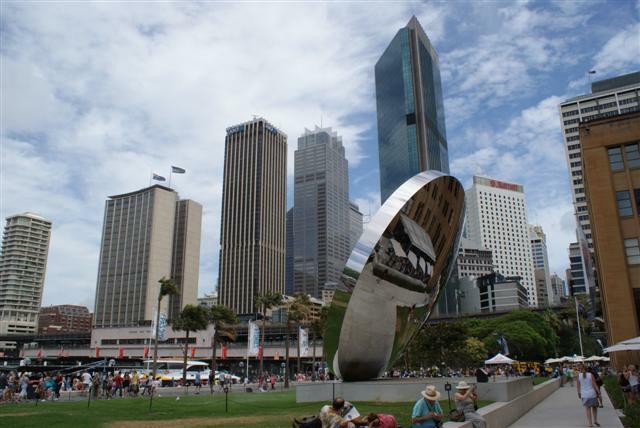 The Aussies commemorate the occasion with a day of events. 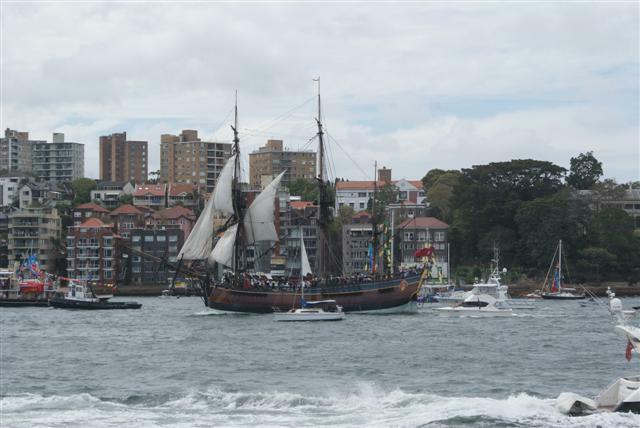 The first event in Sydney was at 11.00 with a Ferrython. 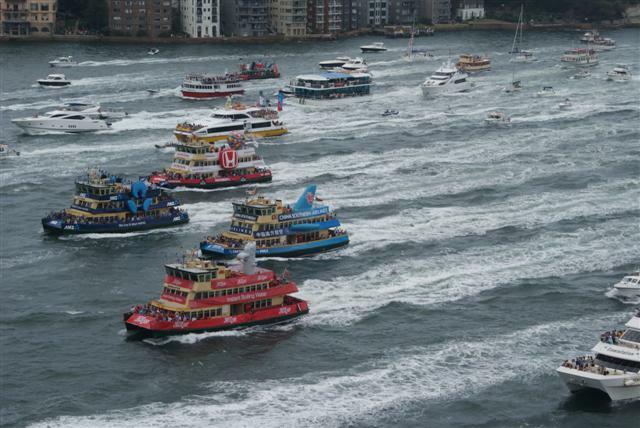 This is a race of four old ferries starting at the Opera house, encircling the harbour and ending with a finishing line under the harbour bridge. We decided the best vantage point would be from the bridge. On our way across we spotted Camomile’s old friend the English ship Soren Larsen, berthed next to a local tall ship called Southern Star. They were both taking part in the Tall ships race later in the afternoon. 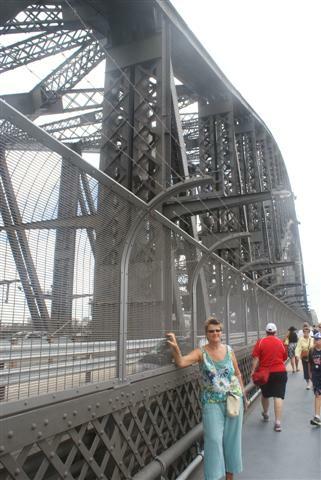 We were pleased to walk on the bridge because it now means we’ve driven in a car, been driven in a bus, sailed under and walked over the top of Sydney harbour bridge as well as walking across it. 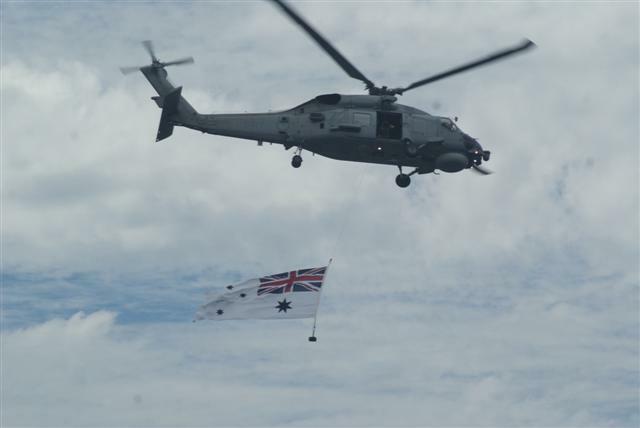 While we were waiting for the ferries to return a RAN helicopter flew over flying an Australian navy ensign much to the delight of the crowd who cheered as it passed by. 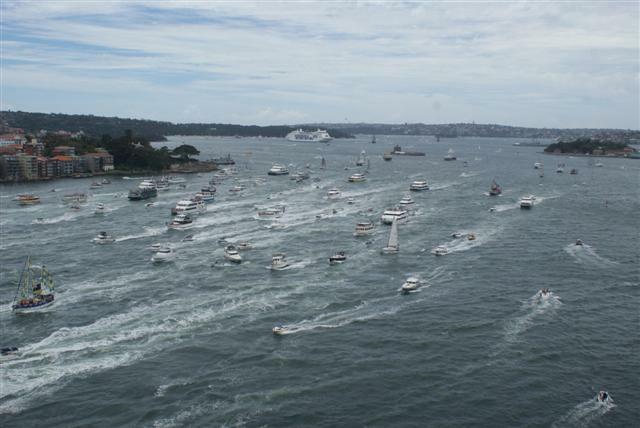 Eventually the ferries arrived and the red one called Zip, who also happens to be the main sponsor for the Sydney festival, won the race. The ANZ blue one came a close second. The ferries were followed by an assortment of watercraft that wanted to join the spectacle. We had considered taking Camomile out but it would have complicated things for later. We had a good view from the bridge. We had some lunch then took up station in front of the Opera house with our friends Dave and Jacqui from Jackster to watch the Tall ships race scheduled for a 2pm start. At 1.30 while we were chatting three RAAF F/A-18 hornets flew past. They were so fast it was difficult to photograph them. 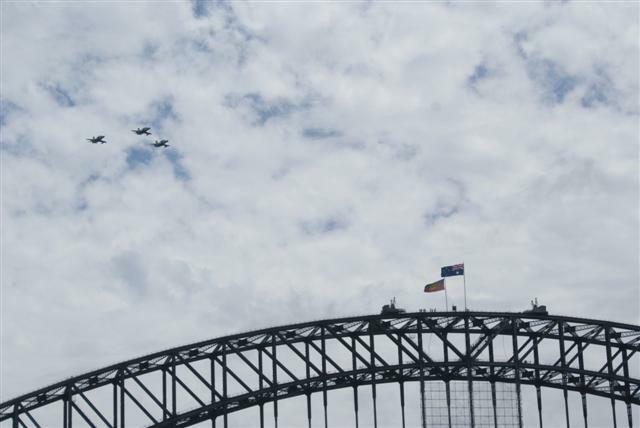 This is the best photo I have of them coming back round over the Harbour bridge, a group on a walk over the top of the bridge had a brilliant view of them. I held my hands over my ears as they roared passed. The Aussies were all cheering. 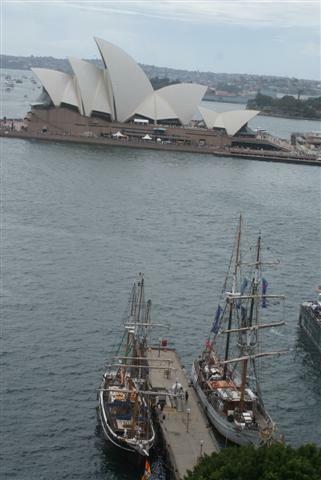 The Tall ships race started at the other end of the harbour and again ended under the bridge. To our delight and cheers the Soren Larsen won followed by the wonderful James Craig that we had visited in the Maritime museum. 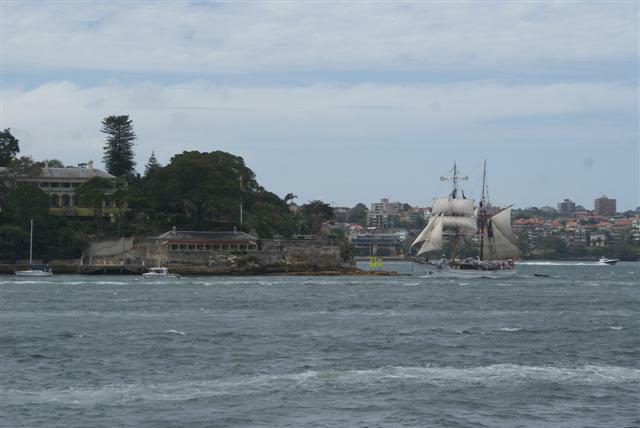 Third to finish was a replica of the Endeavour that is also normally on display at the Maritime museum. “It’s a fair cop Gov”! 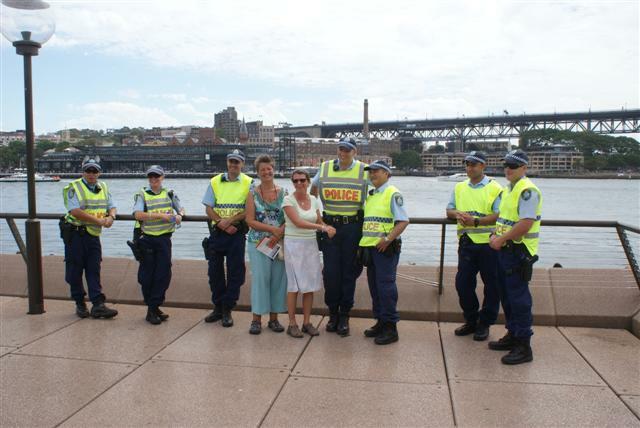 On our way back into the city we came across this group of policemen with very little to do so Jacqui and I had our photo taken next to them. It looks like Jacqui has a guilty conscience as she’s offering her wrists for the handcuffs. Can you see us in the middle? On the way back home we passed the Museum of Contemporary Art that had this exhibit outside. At first sight it looks like a satellite dish but it’s not its art. 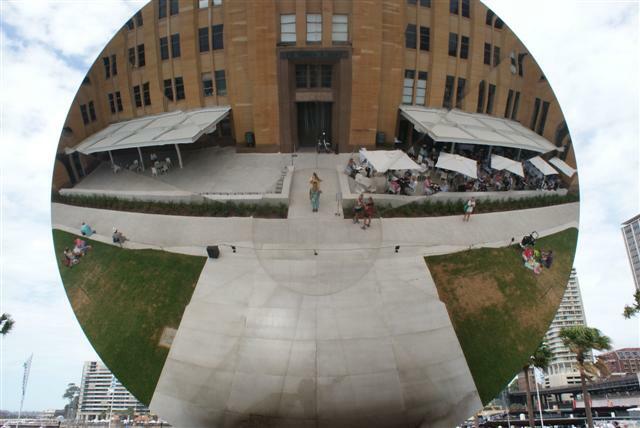 It acts like a big mirror; we stood on the inside and took this photo. I’m in the centre with Bill standing behind me taking the photo. It’s very clever. 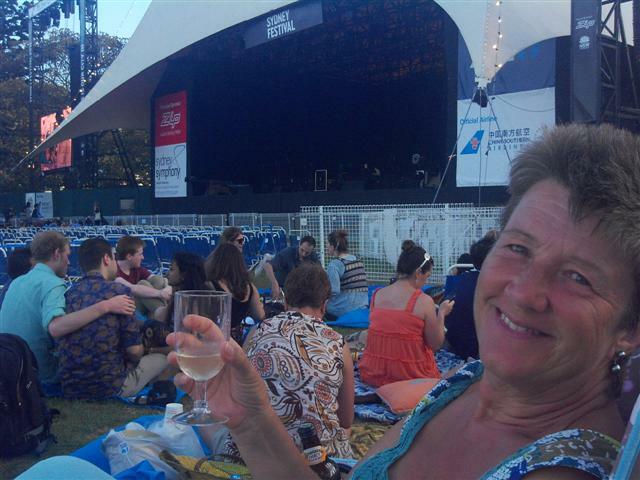 We made our way home and packed up our picnic ready for the free concert in the Domain in the evening. It’s like ‘Party in the Park’ meets ‘Last night of the Proms’, although on a much smaller scale, being part of the Sydney festival taking place over 3 weeks in January. This would be our third and final free concert we’ve seen. The first was soul music, (when we were lucky enough to have VIP tickets), the second was jazz and blues and the third was going to be classical. With an 8pm start the four of us got there just after 6pm to be sure of a good spot. The concert included performances of iconic classical music from Stanley Kubrick’s cinematic masterpieces featured in A Clockwork Orange and Eyes Wide Shut as well as a few favourites from the English Proms concerts. It finished with a Sydney tradition of the 1812 Overture complete with ‘firing canons’, cathedral bells and fireworks; it was an amazing finale. I’ll attempt to post a short video of the end but no promises. The rain held off but the next morning the heavens opened just in time for the bank holiday weekend – just like home really. Posted on January 28, 2013, in Circumnavigation, Coastal cruising, Port posts, Redgrove, Sailing, sailing adventure, travel, Westerly and tagged Soren Larsen, Sydney. Bookmark the permalink. Leave a comment.